The challenge given to me on a recent project was how to light a scene in an environment that had no practical light in it, and no place to hide anything. In fact, there wasn’t even really enough room to fit a camera and actors! In this highly unusual case, we had to start at the (literal) beginning: with the script. 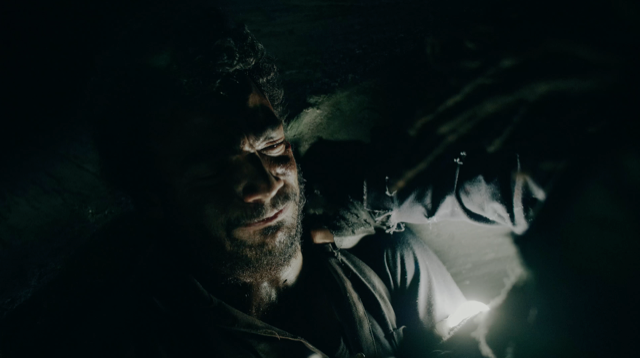 The location laid out in the film was a dark landscape where no light existed – a dark abyss. Originally, the characters were sent “into the abyss” with some form of a glowstick; but after a lot of research and testing, this idea turned out not to be a good option. The genre of the project is sci-fi, so we didn’t want to just have the characters show up with simple flashlights, and I also didn’t want hard directional light to be my only option for set lighting. I researched a lot of stand-alone light units (and trust me, there are a lot) and soon found the Lume Cube. 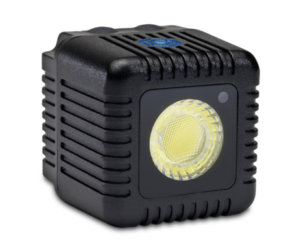 The Lume Cube is a smart LED light that is weatherproof, runs off an internal rechargeable cell, is controllable remotely via Bluetooth, and fits in the palm of your hand! In short, it checked all the boxes. Lume also has many optional accessories available for it, including gel inserts; multiple mounting options (including ways to mount it to a drone – ya, I know! ); and a frosted dome diffusion top (to turn the bright directional lamp into a glowing orb). This simple accessory was what changed my perspective on the light. There aren’t many small battery-operated lights out there that are capable of lighting an entire room. When I saw this accessory on the light, I thought it could make for a great replacement for the glowsticks in the film. It is not a conventional looking light, so my thought was that it could be believable that it was designed specifically for the film’s (story’s) environment. The cube shape made a difference, too: actors could easily hold it, set down, and use in the scene as a tool. Lastly, the quality of the light’s glow allowed me to always have an available light source illuminating the frame in an interesting way. On a practical point, that fact that I could remotely control each unit to adjust the brightness was a lifesaver, because again the sets were all confined tunnels (crawling over actors to tune on a light and check its brightness setting is not as fun as it sounds). All we needed was a little help from the art team to dress the units up to feel like organic props in the environment. After a few tests we concluded this was going to work well for us. We loaded up on Lumes and dome tops and had a rotating charging station to keep us up and running all day. It’s safe to say that at least 90% of the film’s lighting was done exclusively with these lights. Even off-screen, I found myself using a Lume as a key or fill light. It felt like the best tool for the job given our limitations of space. We did a lot of fun stuff on this project. More news/examples of stuff to come. 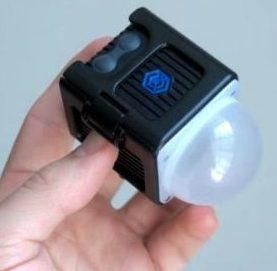 Lume Cube is pocket sized at 1.5 inches cubed, emits a powerful 1,500 Lumens of daylight balanced light and is waterproof to 100 feet and made with a custom lens.